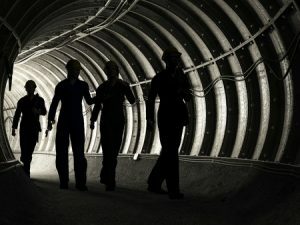 A team of researchers from the engineering department at the Missouri University of Science and Technology is conducting a series of tests that could make coal mines safer places to work. The tests will use explosives to test the integrity of the concrete seals that miners build to close underground tunnels. When these seals are compromised, it can allow dangerous levels of methane to build up in active portions of a mine. The researchers hope their tests will allow them to design more robust seals that are better able to protect miners from methane leaks. The team will begin by building two seals at the Missouri S&T Experimental Mine with the help of Atlanta-based mining safety services provider Strata Worldwide. One of these seals will be rated to 50 psi and the other will be rated to 120 psi. Then, the team will use an “explosively driven projectile generator”— a large cannon—to propel hard hats, bolts, concrete blocks and other mining materials at the seals. Based on their experiments, the researchers hope to determine how much mass and speed a projectile must have to damage the seals. This will be the first projectile test that’s been conducted on coal mine seals since the Mine Improvement Emergency Response (MINER) Act was passed in 2006. Thanks to the efforts of these engineers, the next great innovation in mine safety could come from right here in Missouri.